Many librarians struggle with the best methods, activities, and practices for teaching information literacy. 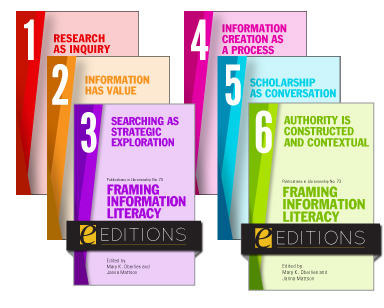 Developing learning outcomes and activities, overcoming student and faculty apathy toward information literacy instruction, and meeting instructional and institutional goals can be difficult if you’re feeling overwhelmed with instructional jargon, or uncertain in your teaching due to no formal training. 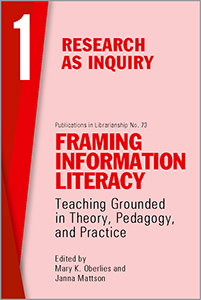 Framing Information Literacy: Teaching Grounded in Theory, Pedagogy, and Practice is a collection of lesson plans grounded in theory and the ACRL Framework for Information Literacy for Higher Education. 52 chapters over six volumes provide approachable explanations of the ACRL Frames, various learning theory, pedagogy, and instructional strategies, and how they are used to inform the development of information literacy lesson plans and learning activities. 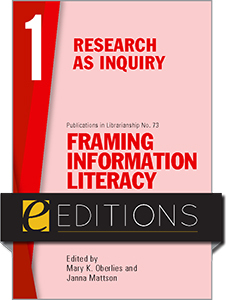 Each volume explores one frame, in which chapters are grouped by broad disciplinary focus: social sciences, arts and humanities, science and engineering, and multidisciplinary. Every chapter starts with a discussion about how the author(s) created the lesson, any partnerships they nurtured, and an explanation of the frame and methodology and how it relates to the development of the lesson, and provides information about technology needs, pre-instruction work, learning outcomes, essential and optional learning activities, how the lesson can be modified to accommodate different classroom setups and time frames, and assessment. The six volumes of Framing Information Literacy aim to address the teaching anxiety and insecurity librarians often experience by offering narratives with the lesson plans that provide insight into the work involved in developing a polished lesson plan; begin filling the teaching and learning knowledge gap for librarians in the context of information literacy, capturing the knowledge and practice of fifty-eight teacher librarians and five teaching faculty from forty-one institutions for others to incorporate and build upon; and to explore how teacher librarians use the ACRL Framework in conjunction with educational theory and pedagogy to help readers form their own approaches to teaching information literacy. Each volume contains the table of contents and index for the entire set, as well as an overarching introduction and conclusion, for easy cross-referencing across volumes. Explore your favorite frame, or collect them all! Chapter 11. Wikipedia vs. the Library: WHY start at the Library Instead of Wikipedia? Chapter 27. What is an Annotated Bibliography and WHY Should I Do One? Mary K. Oberlies is the Undergraduate Engagement Librarian and Assistant Librarian at the University of Oregon. She received her MAIS from the University of Missouri-Columbia, an MA in Violence, Terrorism, and Security from Queen's University at Belfast, and a BA in International Studies from Berry College. Janna Mattson is the Instructional and Social Sciences Librarian at George Mason University. She received her MEd from George Mason University along with a graduate certificate in eLearning, an MLS from Queens College, City University of New York, and a BA in Music from Virginia Commonwealth University.